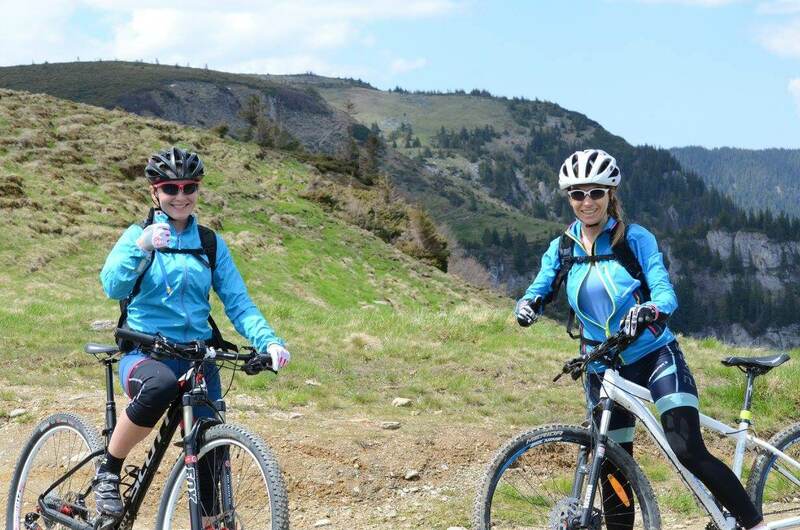 I feel like it was only yesterday that I was telling you about the first mountain biking camp of 2016, which the North Quest had organized mid-April in the small village of Breb, at the feet of the Gutai Mountains. And now May is in full bloom, with crazy and unstable weather that never ceases to surprise you, alternating spring or even summer days with the occasional November day. 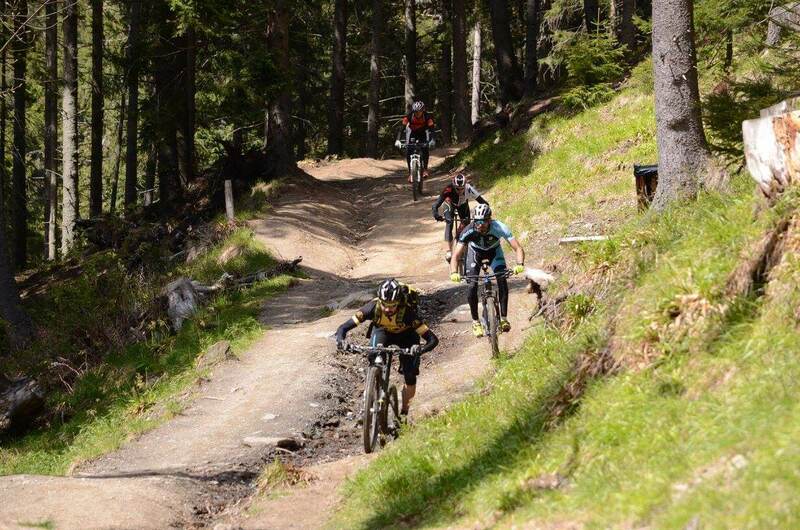 Leaving all complaints aside, May was when we had scheduled the next North Quest event, namely the Purple Lines MTB Camp. 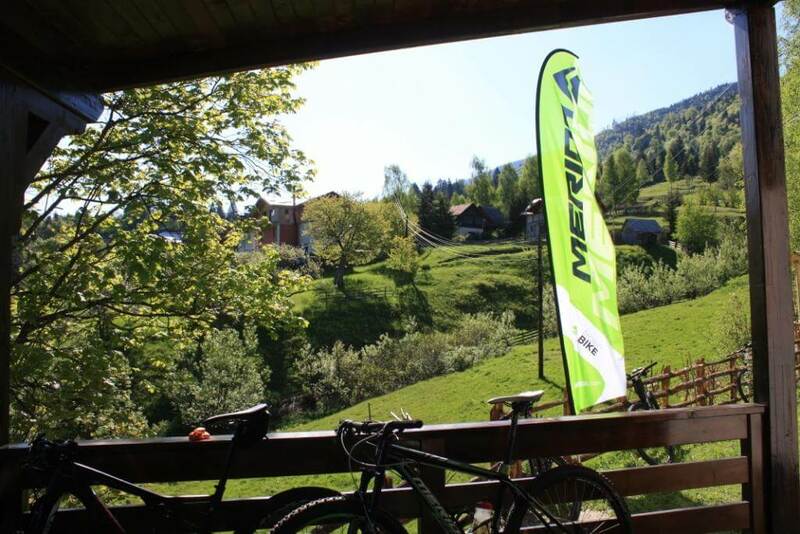 The weekend that has just ended was spent at the feet of the Rodna and Maramures Mountains together with a group of passionate bikers who, while coming from various backgrounds, had at least one thing in common: their love for mountain-biking. And because the Purple Lines MTB camp had more challenging routes than the Breb camp, both in terms of endurance and technical skills required, we were hoping to bring together as many well prepared bikers as possible, but, at the same time, people who could still keep their cool and relax during the ride, instead of racing with a frowning face. Thursday evening saw the arrival of participants from everywhere in the small northern town of Borsa, some of them more tired than the others, depending on how long or short had been their drive there. At dinner time we enjoyed watching the sun set over a clear sky, promising favourable weather even though it had snowed the previous days and the snow layer on top of the mountains was over 30 cm thick. Having quenched our hunger with soup, schnitzels on a bed or rice and a dessert consisting of Nutella or jam pancakes, we spent a relaxing evening over a few beers… or perhaps a few too many. 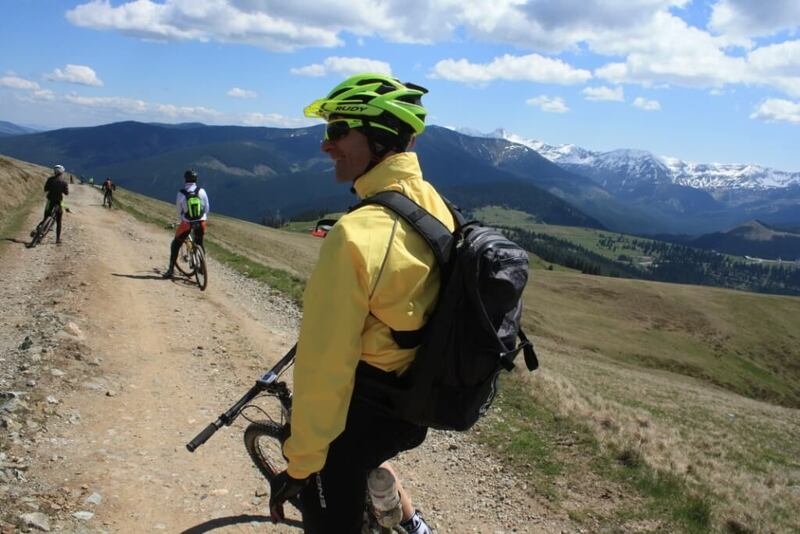 For this camp I had invited along a guy who is my friend and sometimes team-mate too, for better or for worse, the Belgian mountain-biker Wouter Cleppe. Wouter is the kind of person who, leaving aside the mountain biking competitions that he rather sees as a hobby, is annoyingly easy-going most of the time, always in the mood for jokes and capable of discussing just about anything and at any level. 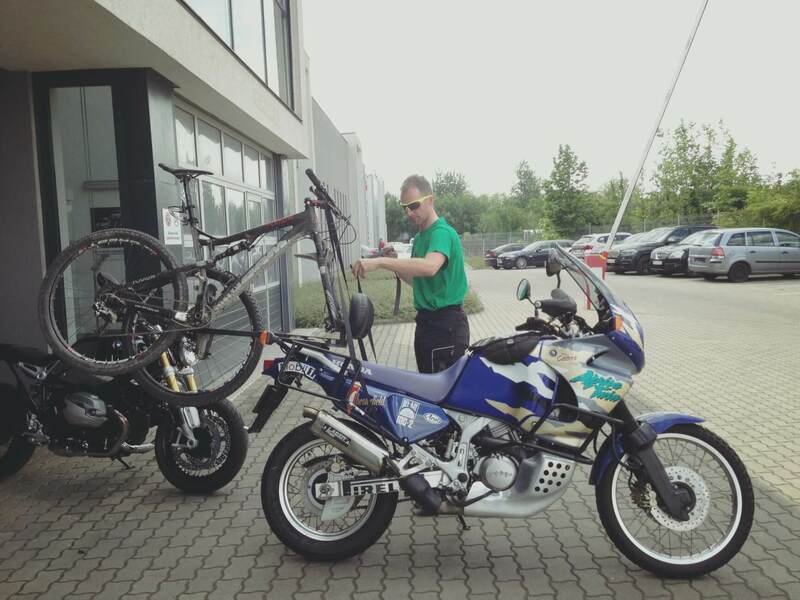 And because he always does things his way, he took it as a personal dare to ride his motorcycle from Budapest to Borsa. I had my doubts as I listened to him enthusiastically tell me about his idea and, unfortunately, karma confirmed my expectations that not everything might turn out perfectly. A flat tire that he got while riding on the highway, because of the rear tire being much too worn out, came really close to having serious consequences. 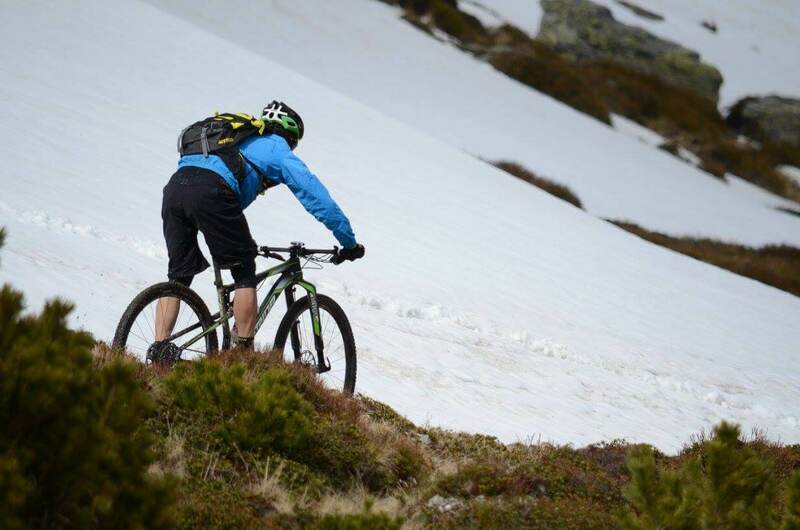 Fortunately, his comprehensive experience in mountain-biking and the numerous lessons he’s learnt along the way managed to save him once more. And since he had reached a town in Eastern Hungary where getting the appropriate tire would have required placing a time-consuming order and waiting for the product to arrive, Iulia went on a little detour to recover Mr. Motorhead from across the border, where he was trapped among rather grumpy people. As we reached our destination towards the wee hours of the night, we all went to sleep thinking of the route waiting for us on the following day and of the various problems regarding organisation that inevitably come up with each event. The morning sun broke through the darkness in the rooms, revealing all around us the kind of scenery that, for a moment, would make anyone forget any other thought. Clear skies, snow-topped mountain peaks and a nicely warm atmosphere were the ingredients of that Friday. 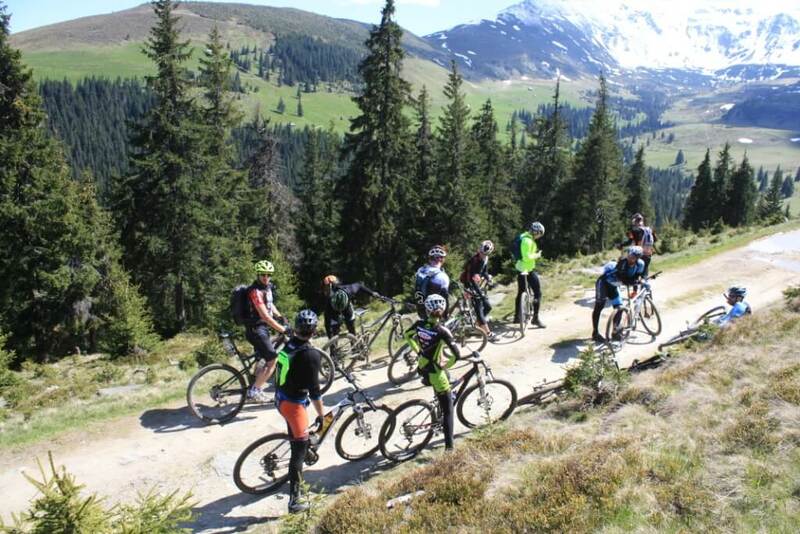 After breakfast and a short presentation of the itinerary for that first day, and once the participants had received their packages containing information about the routes selected for that MTB camp in the Rodna Mountains, everybody seemed ready to party. 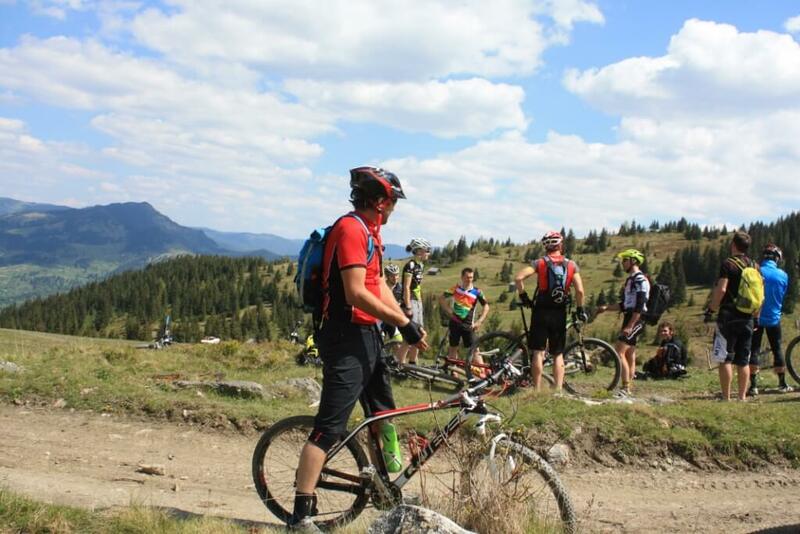 And the party was, in fact, a ride in the Maramures Mountains around the Cearcanu peak, over a route measuring 45 km in length and totalling a vertical climb of 1700 m. We started the ride together, waiting until after the first difficult climb to split the participants into groups with the same level of endurance and technical skills, but also taking into account their preferences! The first peak we reached was guarded by shepherd dogs from a nearby sheepfold, friendly and yearning for some love, which indicated that either the sheep were far away or our group was too numerous. Following a somewhat technical climb through a thick pine forest, we descended on a river bed and then on tractor tracks that proved quite interesting, before we once again found ourselves on the forest road. A flat tire forced us to stop briefly, but with Wouter’s help we sorted it out quickly. We passed by a spring of mineral water so strongly flavoured that it seemed to make you even thirstier than before, then we split into two groups and started the longest climb of the day. 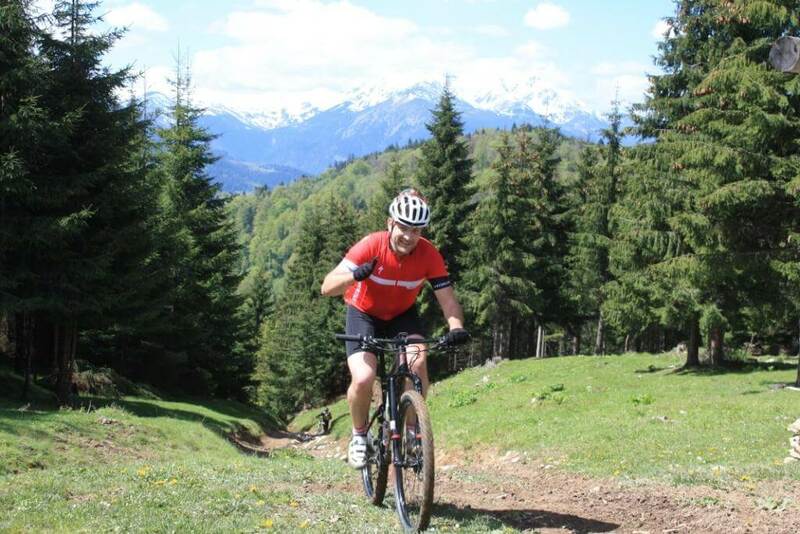 For an hour and a half we kept pedalling uphill, stopping only twice, for short periods of time, to wait for the rest, and then we reached an alpine plain with an elevation of approximately 1650 meters. 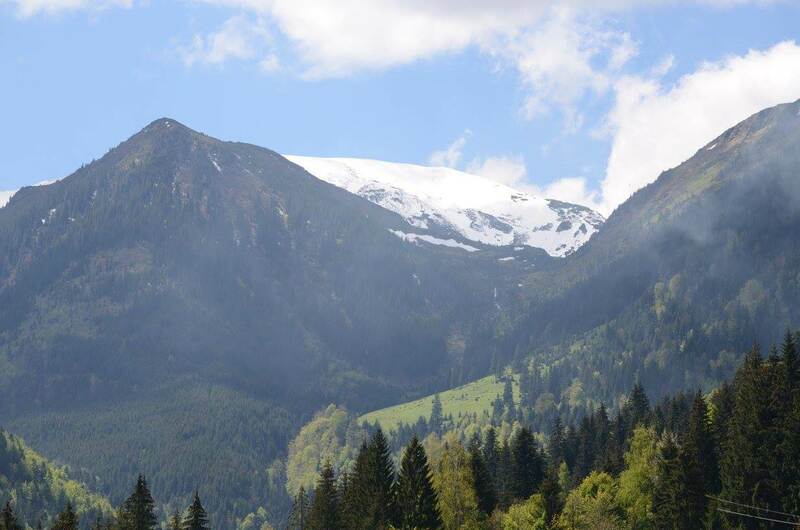 At this point we began a descent on a forest road that we had trouble concentrating on, too distracted by the glorious sight of the Rodna Mountains and its towering, snow-capped peaks. Lovely. 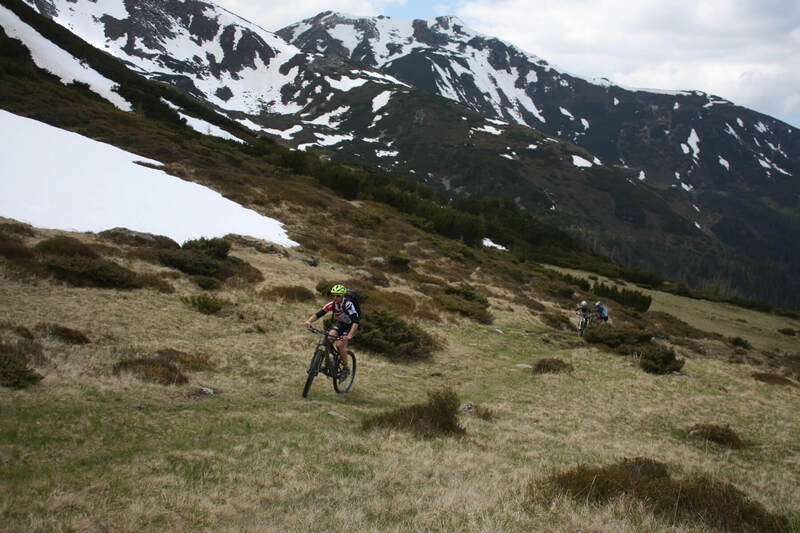 A last climb from the Prislop Pass to Stiol was what got us to the final descent, which was pretty much the cherry on top, except in its more flavoured version of a banana on top of a caramelized cake. 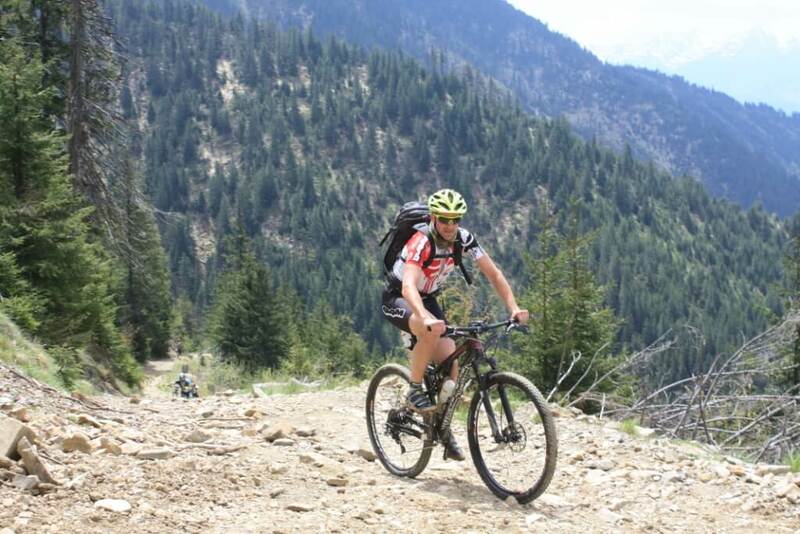 The earth trail was well defined and pleasantly smooth, making you perhaps a bit too self-confident when descending. Fortunately, approximately half-way through the descent we encountered the Horses Waterfall, the largest in Romania, which managed to briefly distract our attention from the fast trail. We didn’t stop there for long, continuing our way downwards on the network of paths and trails crisscrossing the thick pine forest. A deep ditch in the middle and a few trail forks kept us on our toes, perhaps even more than the technical elements of the descent. Once we reached our destination, everyone rushed to tell me how thrilled they had been with the descent! As far as I was concerned, I had strived to keep a more prudent pace and to cub the others’ enthusiasm a bit, knowing full well that the line between excitement and catastrophe is sometimes so narrow you can’t really see it. Back at the B&B we washed our bikes and went through a quick recap of the day’s ride, over a bottle of beer and a less fancy meal. The rest of the day was spent with a presentation that I tried to keep as simple as possible, to provide answers, to the best of my knowledge, to the various questions and curiosities of those in attendance. In the end I was left with the feeling that the presentation might have been actually useful, even though the amount of information is hard to sum up and process in such a short time. The beef minestrone soup, the pasta carbonara and the crème brûlée topped with bananas were the culinary highlights of that day. Outside, Wouter made a valiant attempt at fixing Iulia’s derailleur, which kept falling out of sync with the rest of the drivetrain each time we tried to make it work properly. 30 minutes later he was surrounded by 10 people and three toolboxes, as well as way too many opinions about how he should have gone about replacing a screw that was broken and stuck. The sight immediately brought to mind the days when, racing together in the Transalp competition, I found myself half-buried in a barrel of isotonic drinks, in an attempt to cool down and/or freshen up, while Wouter was busy cleaning his bike chain link by link. The derailleur was eventually sorted out, even though by that time many of the locals on the Bradet street were already running in search of an electrical screwdriver. The snow that had fallen on the mountain peaks over the last few days forced us to give up on what was supposed to be the highlight of the camp, scheduled for Saturday. Even so, we stuck to our decision to reach the Rodna peak, which is why on Saturday morning we formed a group of people willing to put up with the inevitable pain and effort and left for Borsa, determined to conquer the summit after a challenging, but incredibly beautiful climb. As expected, the first half of that climb required quite a bit of focus for those who absolutely wanted to remain in the saddle, though, fortunately, focus was abundant, both in my group and in Wouter’s. Without leaving too much distance between the two groups, we finally reached the first plateau of the day, which also marked our first break. 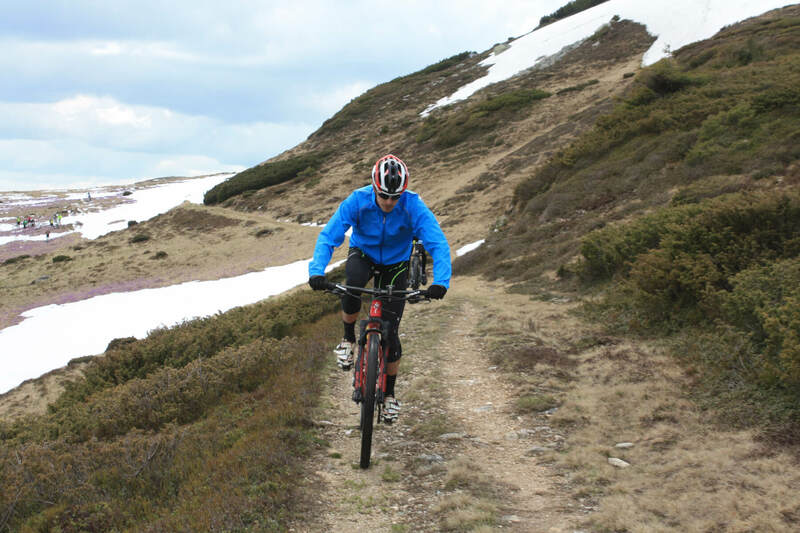 As soon as I reached the point called “Piciorul Paltinisului” I noticed that the trail crossing the steep slope was here and there still covered in snow. We could still ride it, though, if we worked hard enough at cutting our way through the snow. However, even one wrong step might result in a dangerous slip, a couple hundred meters downhill, directly towards the overlapping boulders that mark the beginning of the snow-covered area. Furthermore, because it was by now rather warm, the snow was brittle, and any attempt to use your legs to brake, in case you felt yourself slipping, entailed the risk of catching your foot in a deep hole…which would have been anything but nice. However, my greatest worry was the ledge half-suspended on the peak, above the snowy trail, and which in some points measured up to 5 or 6 meters in height. Taking into account the rather sudden change of temperature and the time of year, plus the snow boulders rolling down the slopes, there were enough reasons not to take the risk. So we had to choose between cutting our way through the challenging area, one by one, so as not to expose the entire group, and looking for another solution. After consulting Wouter we decided to descend a little and attempt a climb through the caldera on the other side. The descent itself proved rather difficult, between juniper bushes, cliffs separated by large holes and brittle snow. By staying focused and with a little help we all managed to cross to the other side. But once we got there, we still had to climb a little through the snow, heading once again towards the peak. So we wasted no time in doing that! Meanwhile the group led by Iulia and Sandor was supposed to go over the same route, but in reverse. 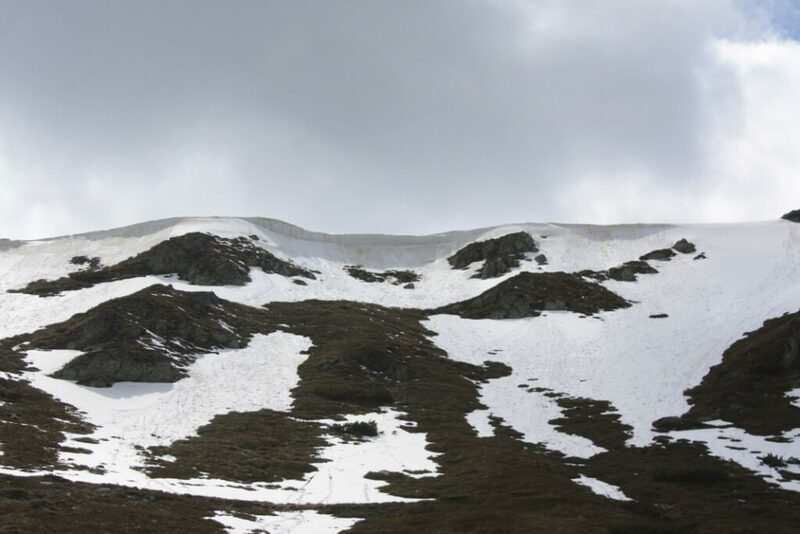 Still, having consulted us through the walkie-talkie and seeing that their own climb was on a slope covered in thick snow, they decided to go back. Which was a wise decision, even though, with a little extra effort, they would have been able to cross through, but then they would have had to face the area we had just avoided. 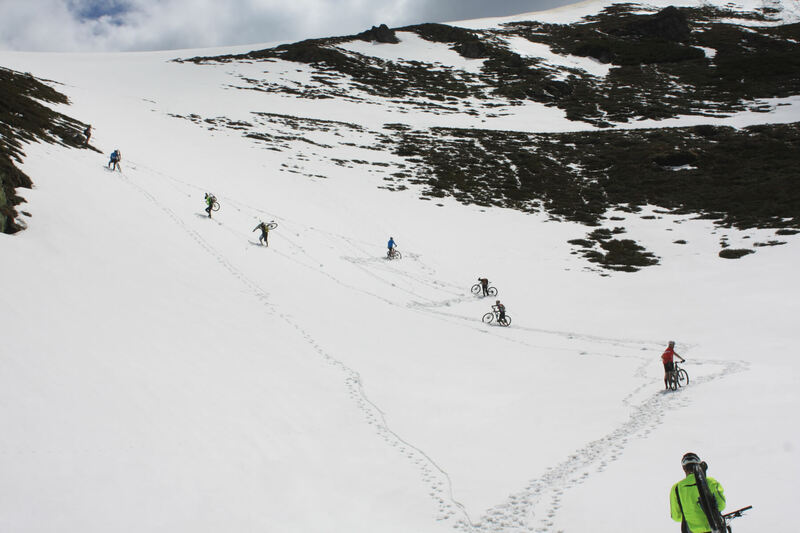 Once we reached the summit area it took quite a bit of effort and determination to stay in the saddle, riding over snow and putting up with the brief deviations from the route. The boys did absolutely great and proved a lot of strength of character, even though many of them were quite exhausted by that point. The only girl in our group, Suzi, seemed to do increasingly better as the climb advanced, and so she was among the first to reach “Saua Gargalau” – the point of maximum elevation for this second day of the camp. What followed was a long descent, the kind where you are forced to stop from time to time, unless you want to reach your destination with your arms swollen and your pulse through the roof, shaking with adrenaline. It’s not a technical descent, but it’s long and it does keep you on your toes! We stopped several times, to make sure everyone in the group was safe, however everyone seemed excited with the ride. The day was capped off by another presentation on nutrition, followed by a dinner that, quite frankly, wasn’t exactly great at reflecting the principles listed during the presentation. When you’re the organizer, you’d much rather have a group of well-fed people than one of underfed athletes. 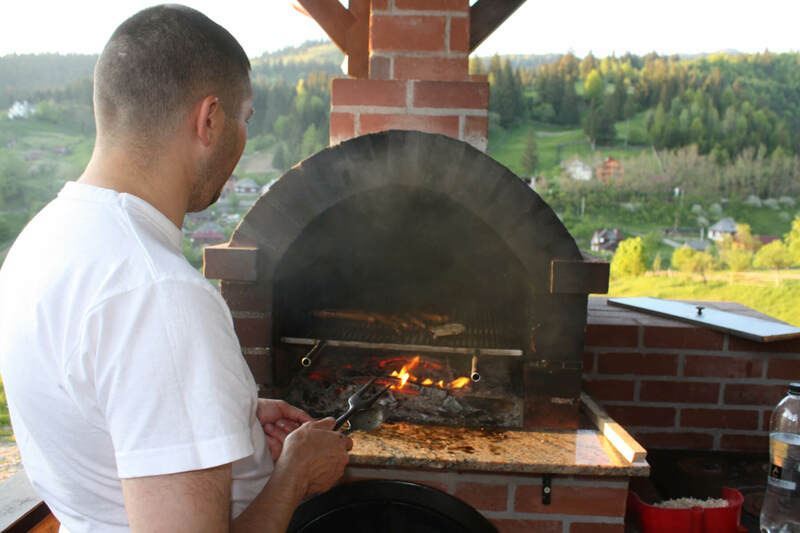 Saturday evening’s meal consisted of chicken soup, grilled meat rolls, pork steak, potatoes, salad and dessert. For Sunday we had scheduled a brief foray into the mining history of Baia Borsa. 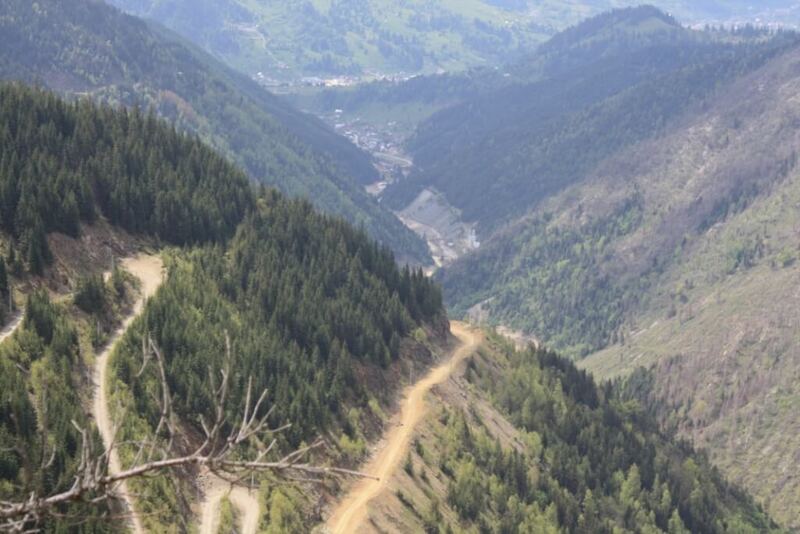 In order to do that, we first needed to climb through Gura Baii, over a road filled with concrete structures, avalanche tunnels and abandoned buildings. From that point on we would have expected everything to go downhill. Except it went quite the other way, as we were faced with the kind of climb that, personally, I found quite challenging, the kind that required me to be in top shape if I wanted to ride it through. And I certainly wasn’t in top shape at that particular moment! I stopped to take a few photographs of the people in my group and of their faces; some wore clear expressions of the strain, others reflected more of their curiosity to discover what was waiting at the end of the climb. However, the one thing they all seemed to have in common was the delight of being there and the obvious fact that they felt comfortable, despite the huge effort they had just deployed. Wouter was able to ride the whole length of the climb, without much trouble, while carrying a 30 l backpack, weakened by a cold, his asthma, and the antibiotics in his blood. It’s true, though, where there’s talent, there’s no use trying to compete against it, as it’s almost impossible to compensate. Having finally reached the summit, I began to fully feel the effects of the cold, and while I didn’t show it, I was actually feeling quite weak. When the group reassembled there were at least 20 of us so I tried to pace myself as much as possible, both when descending and when climbing, to avoid leaving too big of a distance between the members of the group. Then we reached the only note-worthy intersection, where we had to decide on a route to take us back to our cars. We opted for the forest road. We could have chosen a very exciting and technical descent, but taking into account the size of the group and especially the exhaustion accumulated over the previous days I decided to play it safe. I’ve learned the hard way how easy it is to get carried away by the false sensation that you aren’t tired, but your reflexes simply aren’t the same, even though you might feel perfectly fine. The day ended with a brief lunch at the B&B, where I discovered pretty quickly that I had grossly underestimated the appetite of my fellow bikers: the first couple of riders to get there ate through everything like locusts. And rightly so. I still remember the long rides I used to go on many years ago and how starved I felt afterwards. 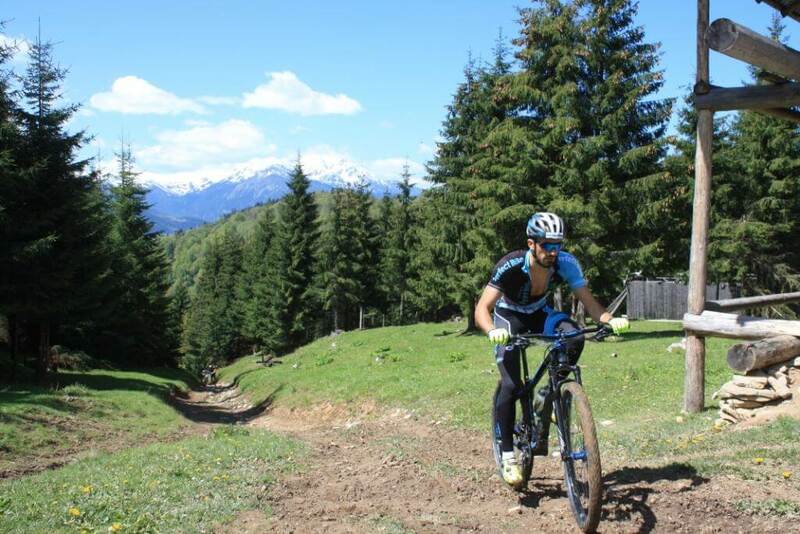 On this third day of the camp, much as on the first one, all the groups had ridden through the same routes, and the group led by Iulia and Sandor had successfully completed the rather challenging ride and done so in a short time too. Good for them! 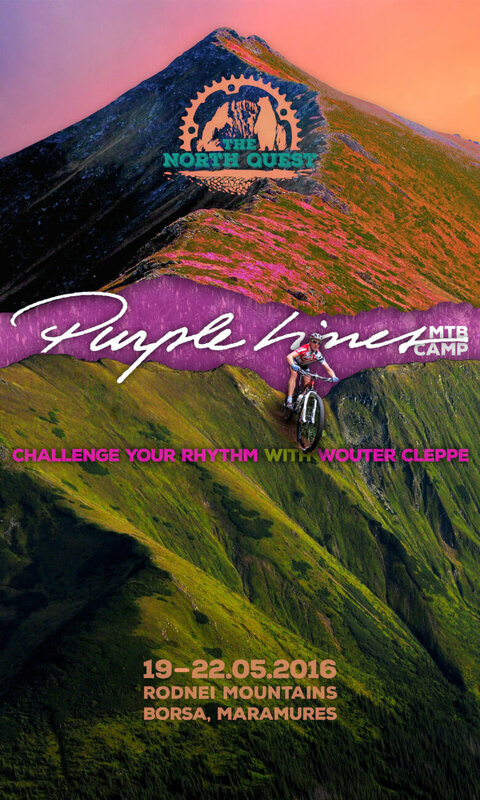 So this was, in a nutshell, my experience of the Purple Lines MTB Camp. I do believe, though, that the weekend meant so much more than a few rides, for everyone, not just for us. We came together as a group of people passionate about mountain biking and for a few days we did nothing but enjoy that passion, we lived it, felt it and gave it our all. Even though the whole experience was rather brief, I do hope Wouter has served as an example and made more people aware of the fact that, even though he’s an exception to the rule, being a highly successful athlete doesn’t necessarily mean having certain traits that we encounter way too often among our very own success-oriented athletes. As far as I’m concerned, I realized I much prefer this type of experiences to the laurels that any sort of rice might offer me, and if that makes me look like someone who’s lost his motivation, well, I’m grateful to the numerous people who participated in the North Quest camps, because they’ve significantly helped me reach this excellent point! 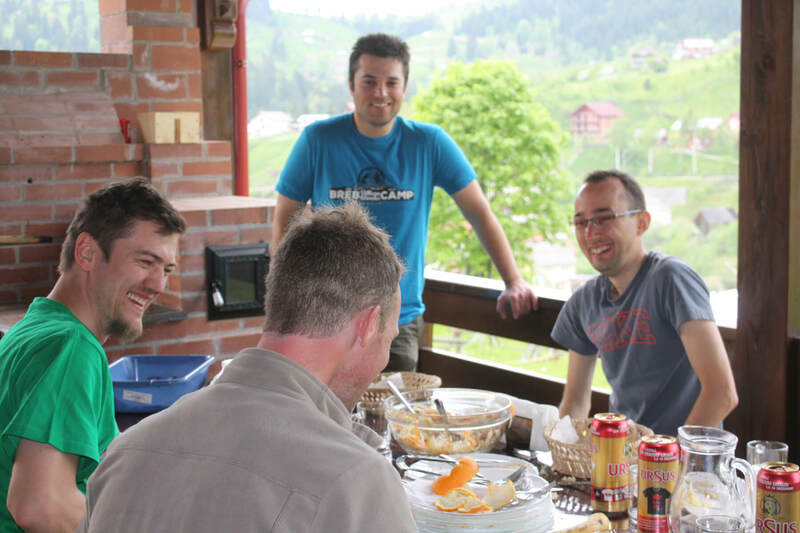 As things are always moving, we’ve already started planning our next MTB camp, as well as working on a new type of experience that we would like to offer you, somewhat simpler and kind of different, but in a good way! Follow us on Facebook and, soon enough, on our new web site. 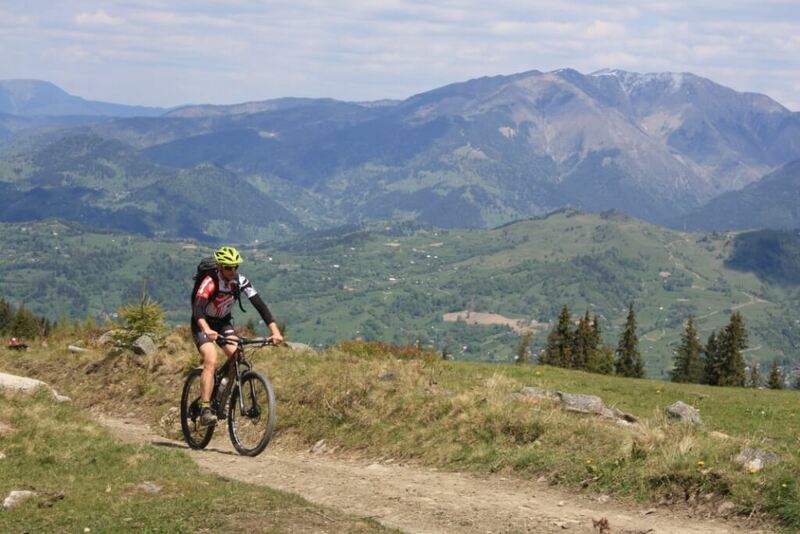 If I manage to shake this cold off I might see you at the Bike 4Mountains competition, a race it would be a pity to miss, no matter your results or training level!